The In Print affiliate, Chicago Writers’ Association hosted the 6th Annual Writer’s Block Party Saturday, August 26, at the Gail Borden Public Library in Elgin. 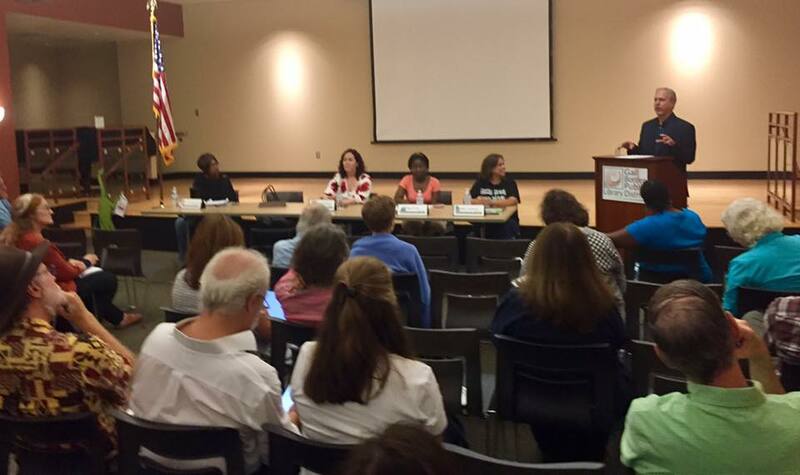 I was proud to be a part of the panel featuring Jennifer Brown Banks, Marcie Hill, Becky Sarwate, and Charlie Monte Verde. Author Dan Burns was moderator. Originally, Social Media expert Dan Blank (We Grow Media) was going to video chat with us but unfortunately he had a scheduling conflict. Instead, he kindly put together this video where he talks about making personal connections through social media and how this marketing can be part of the creative process. He believes you should be selling yourself and what you have to offer beyond your product. With a five person panel and lively, interactive audience, we didn’t have time to view Dan’s 30 minute presentation, but I encourage you to click on the video link above and watch. Between the panel Q & A, the crowd Q & A, and the pizza & socializing, we pushed right up against the 4 pm closing time. Confession 1: I felt out of my league on this panel of social media experts. Confession 2: I’m okay with that. I opened with “Hi, my name is Mary and I’m a Facebook addict,” to which the crowd compliantly responded, “Hi, Mary.” I use social media VERY socially. My Facebooking and Twitter and Monday blog posts are more personal than professional. I learned a lot from the other speakers and will share those points in future blogs. But I’m okay with my contributions to the discussion. I believe many of the audience members might have been new to the whole thing and I like to think I offered informal insight into an ever-growing and potentially overwhelming world of new-age marketing. Thank you CWA for the opportunity to participate. If you are curious about the ins and outs of social media and how they relate to authors, stay tuned! I’m so sorry I missed it — can’t wait to hear more!